Sales prices were 91.78% of list. 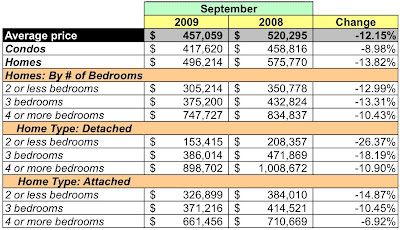 At September's sales pace, there is a 5.35 month supply of condos and 6.39 month supply of homes listed for sale, slightly higher than the previous month. 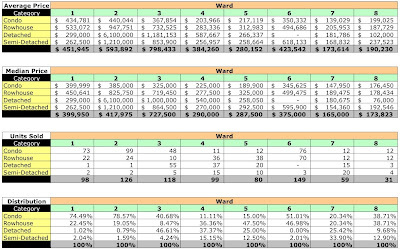 I've begun processing the District's sales data for August 2009. 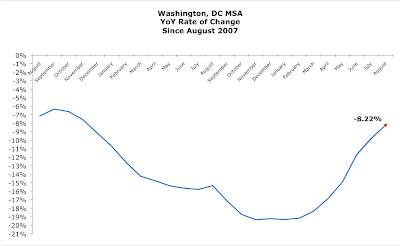 While I'm in the early stages, here's an early [unadjusted] peek at the data. 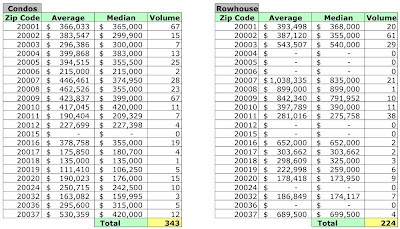 I've finished processing, geocoding, and uploading sales data for July 2009. 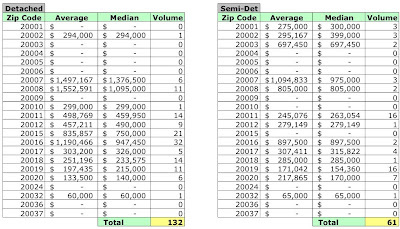 The table below shows July 2009 average and median sales prices and unit volume by zip code and the percentage change from July 2008. This blog is starting to sound like "99 Bottles of Beer on the Wall" - each month's verse is the same, it's just the month that changes. 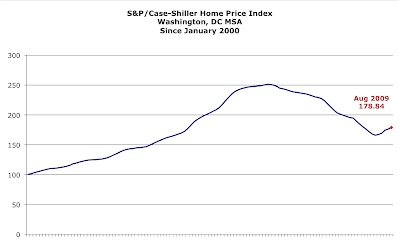 Once again, sales volume up, prices down. 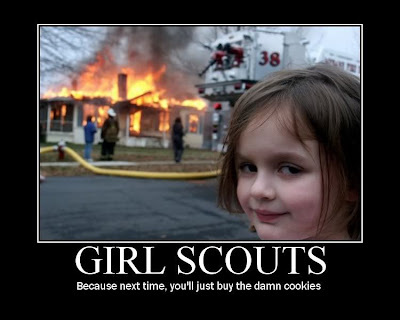 "Sell one more, for a lower price..." I think I'll stick to my day job. I noticed our Canadian friends have bought another property, a rowhouse near the Capitol, paying slightly more than $2.2M. I guess the toonie goes further down here now. 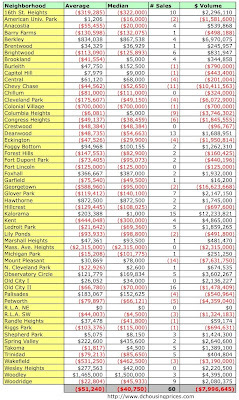 In July the District recorded 760 residential sales. 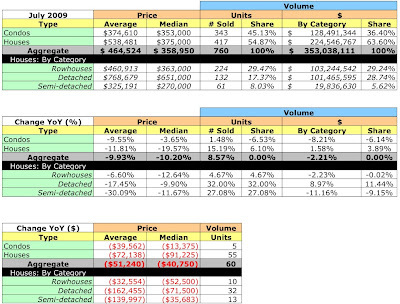 Overall, prices were down, sales volume was up. District-wide, average sales price fell 9.93% and the median sales price fell 10.2%. Unit sales were up 8.57%. The condo market suffered a 1.48% increase in unit sales and dollar volume declined 8.21%. The number of homes sold grew a healthy 15.19% and dollar volume was up a slight 1.58%. 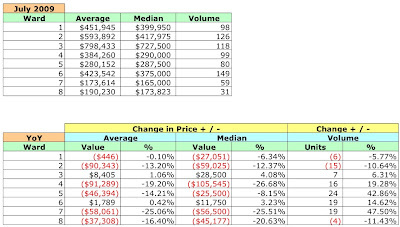 However, average and median sales prices for homes fell sharply, down 11.82% and down 19.57%, respectively. 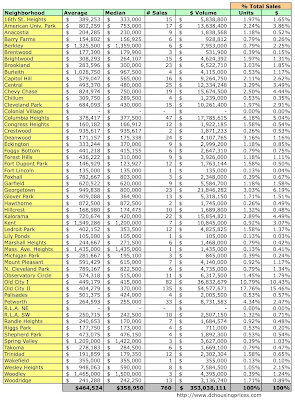 By my estimation, foreclosures accounted for 68 of the recorded sales, about 8.9% of sales. 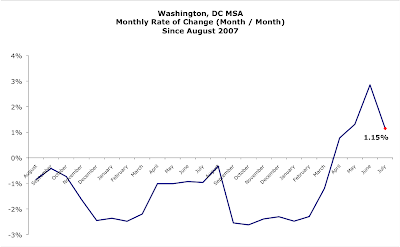 All but two Wards saw declines in average and median prices; two (Wards 3 and 6) had positive price growth. 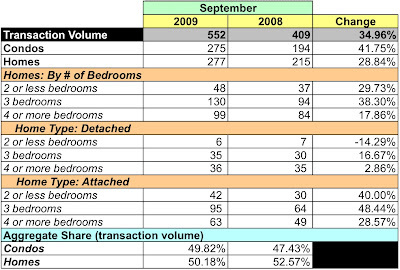 Despite that, all but three had an increase in unit sales. 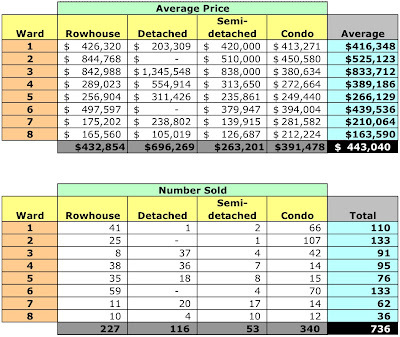 Condo sales ruled Wards 1 and 2, constituting 74.49% and 78.57% of units sold, respectively. 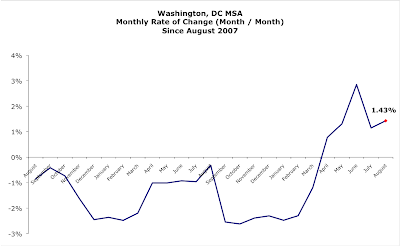 Almost all neighborhoods saw declines in average and median prices. 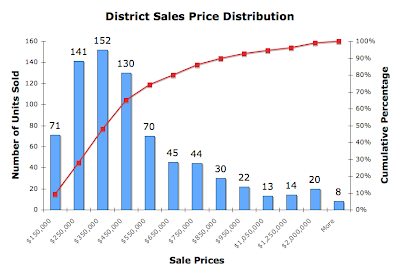 The chart below shows the distribution of July's recorded sales by sales price.